The Atelier franchise has always been one I wanted to get into, back when my then girlfriend bought one of the games. While the concept was intriguing, it was my lack of knowledge of where to start in the timeline that proved be a hurdle. The Atelier Arland Series Deluxe Pack is the perfect introduction because it welcomes you into the Arland Trilogy, a collection of games that flow together quite well. The core concept of the Atelier Arland games doesn’t really change between titles. You play as an alchemist in the fantasy kingdom (and eventually republic) of Arland. A rare and useful member of the society, you craft powerful items by synthesizing them using gathered ingredients. However, you’re not just a glorified item mixer, as the ingredients are collected by the alchemist herself by gathering from plots around the wilderness and slain monsters. And so, the Atelier games wear a multitude of hats. Before we start talking about each game individually, I have to point out that as a whole, the visuals and sound design are spot on. Mixing in colorful cel-shaded overworlds and models while defining items and characters with 2D drawings, the art design conveys a bright and interesting world. The biggest flaw is the monster models, as slight color variations and reskins appear frequently among your foes. A bit more variation in them would have been nice. The soundtrack is also strong and complement the game with high energy tracks. I find myself still humming and whistling the tunes, a sign of their catchy nature. The real star, however, is the voice acting. Massive chunks of dialog are given fully recorded lines, and each character is performed exceptionally well. In a story-heavy game, it was nice to have spoken words to help give life to each individual whom we spend so much time with, making them that much more endearing. 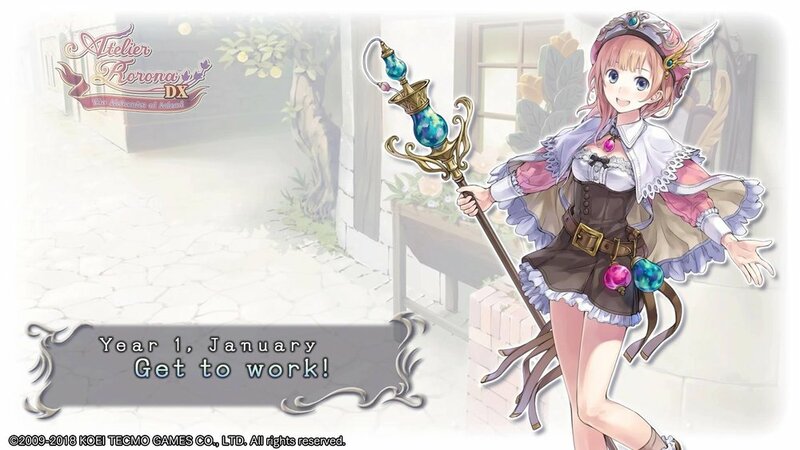 The first title, Atelier Rorona: Alchemist of Arland DX, is where we start our adventure. Each game has a full and in-depth timeline that wraps up during play before blending into the next. A majority of the setup starts here and our first protagonist is the titular Rorona. I feel like this has the smoothest storytelling of the three games, but also the simplest. Working to its favor, Rorona has the benefit of introducing concepts, rather than building through references like Totori and Meruru do. Starting without too much fanfare, story progression doesn’t feel overwhelming or forced. The game begins with Rorona working with her alchemy master, Astrid. Rorona is a very bubbly and cutesy girl, but shy and often doubts herself, with Astrid’s sarcastic personality not helping. They’re visited by a knight, Sterkenberg aka Sterk, who informs the alchemists that their shop is being threatened with closure unless they can prove their worth to the kingdom. To do this they are given twelve tasks, each with a deadline of three months, and failure in any of of them results in the shop being shut down. With all this looming, it’s at this point that Astrid gives shop ownership to Rorona, putting her in control of whether the shop succeeds or falls. The first and biggest flaw with Atelier Rorona: Alchemist of Arland DX, as well as the subsequent titles, is the in-game time mechanics. The dates move based on days rather than hours, making time move quicker than it might appear. To synthesize any items, you’ll spend at least a day, with powerful or multiple items eating away several days all at once. Going into the field requires a few days of travel, then sub-areas in it take days after you complete your expedition into each. Time management is the key ingredient in the game. Item synthesizing is fairly straightforward — use certain ingredients for a known recipe to create a new item. This is the lifeblood of the game, as crafted items are used to fulfill requests, and have use in battle. Each creation grants synthesize XP, which allows you to make stronger items more successfully. Where things start getting more in-depth with synthesizing is the trait system. The collected ingredients come with different levels of quality and special traits that grant bonuses. Some of these traits will adjust the selling price, or grant boosts to the healing or explosive powers of crafted items. These bonuses are also what help make the strongest weapons or armors, as they will transfer to the crafted items that can be used at the blacksmith. A cost system is implemented to install the traits. The stronger the level of an ingredient, the more points it grants. The traits are bought with the points, with up to five to be chosen. This gives you the ability to transfer powerful boosts throughout made items, while controlling what perks move on. When it comes to field work, Atelier Rorona: Alchemist of Arland DX has a surprisingly fun, if simple, system at hand. Maps are broken into small segments, full of a few gathering points. By traveling down particular exits, you’ll be lead to new areas. The day cycle is worst here, as to explore areas fully, you’ll burn through a few days at best, or a good chunk of them at worst. Monsters also inhabit the maps, and combat with them is effective in its simplicity. A traditional turn-based style, Rorona and two allies take on monstrous opponents. You’ll form a party by asking friends to join you, though there’s a fee to leave town with them that can be brought down over time. The lack of any major diversity while fighting is both the best and worst part of the system. Skirmishes feel and operate more like an appendage of the synthesizing pipeline, rather than designed to stand on its own. With certain items being exclusive to monsters, hunting them can become a necessity. While many battles are resolved by mashing the attack button, a speed system provides at least some tactical input. The turns are not a set back-to-back, but rather on what I’d call a multi-slot set up. After taking an action, characters move a corresponding number of slots down based on their stats. This means it’s possible to have faster characters take their turn again before the monster. By choosing your targets wisely, you can end up taking less damage (if at all) during combat. The strongest portion of Atelier Rorona: Alchemist of Arland DX is the characters. On the whole, the Atelier Arland Series Deluxe Pack features a gaggle of fantastic personalities, all distinct from one another and yet deep in their personal stories. Rorona mixes in player choice with characterizations the best among the games, as your party member selection provides unique interactions and cutscenes. With a fairly sizable roster provided by the game provides, there are many unique interactions. Multiple endings are also something the series do, and I am proud to admit I completed the game with the normal ending. The replayability factor is a plus, and there is enough content on the whole to make it feel substantial in its application. There’s also a post-game I suspect was added during the remastering phase that, with just a brief taste of it, tells me I’ll have a lot more fun in my future with the game. After the conclusion of Rorona’s tale, we move to Totori, five years in the future. 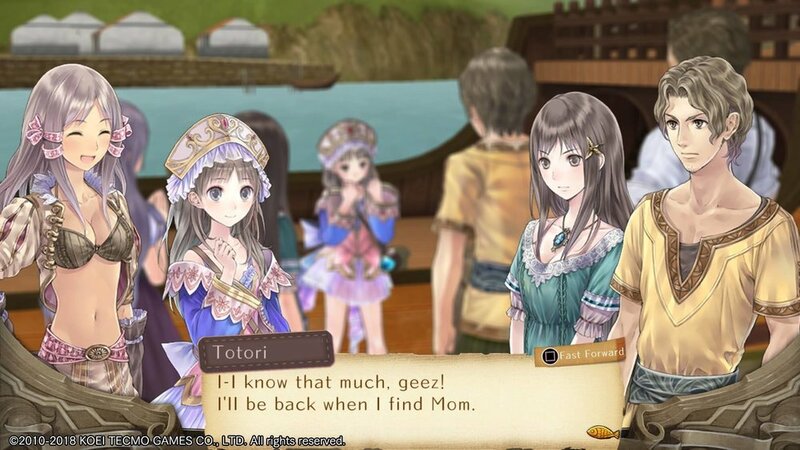 Almost a bit of a black sheep, Atelier Totori: Adventurer of Arland DX features a host of changes across every aspect. The base game remains the same, but the story setting and lore evolves into a completely different atmosphere. A host of new and altered gameplay features also help remold the franchise. With the alteration of the Kingdom of Arland into a Republic, a rise in Adventuring blossoms is regulated by this new system of government. Acquiring their Adventurers License from the Capitol, Adventurers rank up by performing tasks, such as fighting monsters or delivering items. This forces those with the license to remain active, working up towards getting a permanent license. Starting off in a small fishing village with an oddly-dressed girl named Totori, we learn that she’s an alchemist in training, official apprentice to Rorona. After the events of the first game, Rorona decided to roam around the country and attempts to teach alchemy. Totori was the only one capable of picking up the skill. Now, one thing I didn’t talk much about while discussing Atelier Rorona: Alchemist of Arland DX, is the personality of Rorona. While she goes through a character growth, she retains her innocent and often childlike mindset. Her shy nature and lack of self-confidence must have transferred to Totori, because she suffers them similarly to how her teacher once did. As the world starts to mold her, Totori breaks away from these comparisons, but the personality mirror to start with wasn’t the best of introductions. Totori does differ vastly when it comes to goals, as she has her mind set to becoming an Adventurer. Thanks to learning alchemy, she sees it as a way to overcome her weaknesses and survive in the wilds. The force behind her desire to become an adventurer is because her mother, an adventurer in her own right, went missing awhile ago and Totori yearns to find her. The story as a whole is just as strong as in the first title, and in my opinion might be actually stronger. Where Rorona had a single shop to focus on, and the plot lines were small and self-contained to the area, Totori has her tale stretched across a larger world. It also holds more moving parts, as her ambitions are multi-faceted and require balancing personal goals between professional objectives. Atelier Totori: Adventurer of Arland DX features weaker characterization despite its stronger story. While the first game had a great setup building lore between your traveling duo, Totori instead gets the interactions with her companions. The characterization in these moments are still strong, and they’ve replaced the lost ally interactions with unique recipes and situations. Still, despite the positive changes, it was disheartening to lose out on such a unique lore-building experience. What stands out most is the new gameplay elements. On the positive side of them, you have a strong amount of new and varied traits. These new traits end up being more descriptive in nature with terms being adjectives, granting the synchronizing system more flavor and life. It also allows each item you craft to have a more unique feel to them, adding a personal touch to your work. The rest of synchronizing remains intact compared to the previous installment, but gathering and combat are where Totori starts to really vary in its gameplay. While combat is kept the same for the most part, one key change represents one of the biggest flaws — the turn system. 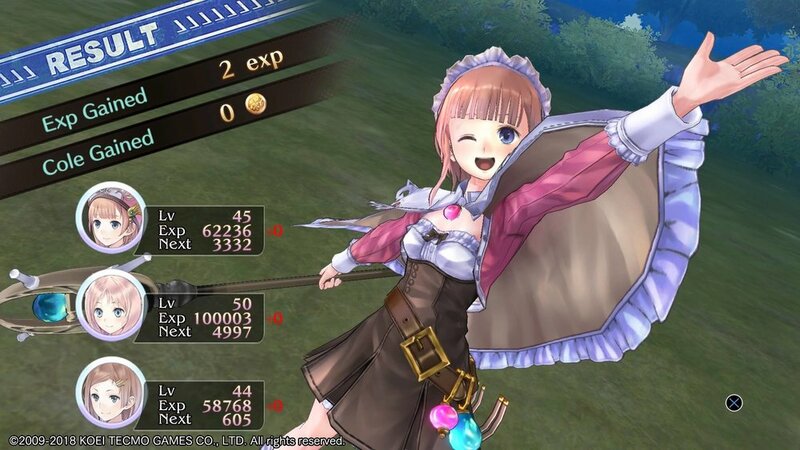 Atelier Rorona: Alchemist of Arland had a fluid speed system that allowed characters with high stats to have quicker actions. Totori goes for a strict turn-by-turn system, where speed only controls character placement. This makes fighting much more difficult, though I need to give credit to the mixture of gameplay and characterization. The power differences between characters in battle backs up their in-game lores, therefore reinforcing them through gameplay the best of the Atelier Arland games. The map exploration is where the most extensive modification was made, and I find myself split on it. On one hand it’s great, as it allows for a stronger map to explore. Instead of subsections in a single hub area, it grants a more fluid and evolving map, meaning traveling can take less time. Having said that, the other alteration to the formula brings it down a bit. Gathering and starting fights now cause days to move forward in the field, akin to a small time payment per interaction. This means time ends up moving as quickly as it was before, though a silver lining is the facade of control over time. Not exactly an equal trade-off, but I’ll call it a step in the right direction. This is also mitigated as well since Totori works with larger deadlines. A flat three-year deadline, she is given her license with a growing checklist of tasks that provide points to level up her status. The points are awarded for everyday things, so synthesizing, killing monsters, exploring the map, fulfilling requests, and more, all grant points. On the subject of these requests, Totori has what I would say the weakest set-up in the trilogy. Rorona also featured timed deadlines, but gave ample opportunities elsewhere to make money. Totori has no such luxury, often requiring several days of travel to complete the majority of requests. With time management reigning supreme, it can often cause anxiety towards completing them quickly. The rewards are stronger than in Rorona, especially with some changes made to them, but the design just doesn’t work as well as it should. One thing the game doesn’t tell you is that exploring character lores and relationships is key to getting the best endings, and even finishing the story. While I could proudly boast about first run through of Rorona ending with the respectable Normal Ending, my time with Totori stopped with the bad ending. This is because her personal goals are not just filler, and you need to make sure you level up Adventuring Totori as much as you do Alchemist Totori and Combative Totori. So, it’s easy to assume based on my previous rankings that I consider Atelier Meruru: Apprentice of Arland DX to be my favorite title in the Atelier Arland Series Deluxe Pack. Yes, it’s true, and what makes Meruru the best to me is because it takes advantage of the effective features, while creating new concepts to compliment them. Once again moving five years into the future, we find ourselves no longer in Arland proper, but instead entering the Arls Kingdom. Located far north of the Arland Republic, it’s set to be absorbed into the Arland Republic. Despite that, the King and our main character, Princess Meruru, have an important task of making the transition as smooth as possible and helping to be a productive and prosperous state. Now, Meruru has the honor of not only having the best game of the trilogy, in my opinion, but she’s my favorite of the three protagonists. This is because while she exhibits the same self-doubts the others did at times, her personality is much more upbeat and positive on the whole. Her quest for self-growth comes more from finding a purpose as the princess and an individual, rather than just becoming a stronger person. Her actions hold more weight, due to the goals she faces with completing. The other characters that reside in Arls are also fantastic, as is a norm with the series. Exploring their lores can be difficult, as the roster ends up getting quite sizable. 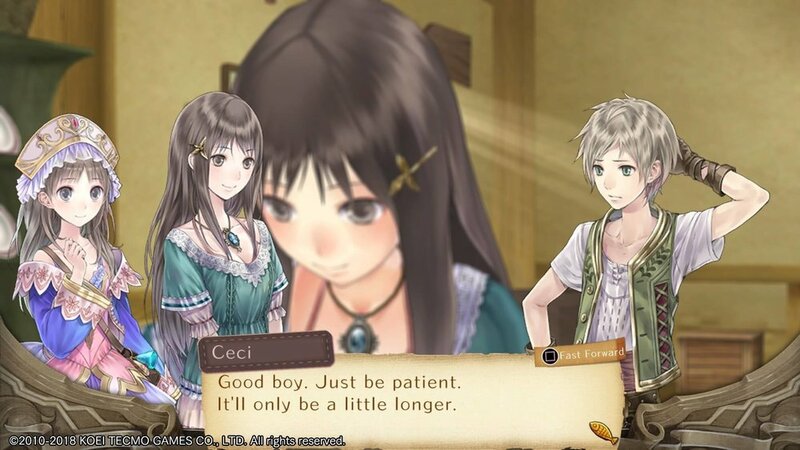 Atelier Meruru: Apprentice of Araland DX adds not only strong new characters from the populous of Arls Kingdom, but almost every other ally from the first two installments. Character management and party choice can become a bit overwhelming, but the diversity of the cast is the other side to that coin. Storywise, the game has flavors from both Rorona and Totori’s goals. Meruru becomes an alchemist after meeting Totori in Arls, and asks her father to become an official alchemist. He initially says no, wanting her to focus on improving the kingdom. When the idea of using alchemy to help expand and grow the kingdom is pitched to him, he agrees to give her a few years to prove herself. The synthesizing is more akin to Atelier Rorona: Alchemist of Arland DX. We get less overall traits, but there’s more than enough new and returning recipes to keep you busy. Also, where they were only learned from new books before, Meruru unlocks them not only through that method but also after every so many Alchemist levels, making her feel like she’s growing stronger in the craft. Atelier Meruru: Apprentice of Arland has a hub world that is built by combining the best of the previous two titles. Set in a single local like Rorona’s Arland but opening the lands around it the way Totori did, gives a more intimate, yet detailed experience. Meruru’s town also grows as she improves it, again making you feel like your actions are having a strong impact outside of only hearing it from the characters. By completing tasks for the citizens, and exploring new areas, the map will expand and evolve. Defeating all the monsters in certain areas when tasked to will unlock new paths and areas which can be improved. All these actions give you points, a la Totori, but you use them to build new facilities which unlock bonuses or additions. It’s a great system that creates the rewarding feeling of License points from Totori, and adapting to them to the task system of Rorona. A sizable area of improvement is made in scaling, as evolving the lands goes beyond just visually. The level of ingredients in and around areas you’ve been improving go up, adding stronger traits and higher qualities. No other game featured this, and it does a great job of providing rewards for progression. Thankfully, the time to travel between areas has been cut down. The system where gathering and fighting pass days returns, but by shortening the travel between areas, it’s made to feel less of a burden. Add into this the ability to avoid combat with vastly lower-leveled monsters by hitting them with your staff in the field, and exploration is at its peak for the series. Combat goes back to the time slot system, making it once again more strategic and more enjoyable. More bosses appear than in any other previous title, but they are spelled out and feed into the request system of the story. It continues the growing trend of Atelier Meruru: Apprentice of Arland DX blending gameplay into the story, and the story into gameplay. As for the endings, I seem to have found a place between normal and bad. There was no explicit definition given, but based on the finale, it seems I did my job competently, though not exceptionally. While many games might make you feel apathetic at trying your hand again, I’m excited to jump back in and try to get a better ending next time. Atelier Arland Series Deluxe Pack is overwhelmingly cute on the surface, yet deep in its design and I recommend it with everything that I can. The lore-building is heavy, with small cutscenes popping up all the time (sometimes too much, I must admit), and every aspect of gameplay builds off of the story beats. Yet, despite being such a narrative-driven games, the gameplay aspects are deep and rewarding. I often would find myself trying to quit, but taking an extra half an hour to do so because “there is just one more thing I have to do!”. The amount of things I don’t have time to explain is staggering, as there are a shockingly high number of concepts explored. A brief taste of the post-game content I experienced just before writing the review literally surprised me, and that was only for the first game! The Atelier Arland Series Deluxe Pack is stuffed with quality content that will keep you playing for hours on end, even after the main story lines have ended. When I gave The World Ends With You Final Mix a perfect score, I did so because it reflected not a flawless game, but one that overcame its blemishes and left you feeling positive. That’s why I’m once again granting a perfect score. The end result of playing Atelier Arland trilogy is equivalent to finishing a strong book series. The individual pieces are engaging on their own, but together they craft an experience that is of S quality. Sometimes all you want to do at the end of a long day is to sit down and murder a couple hundred (thousand?) demons. Nights of Azure 2 gives you the chance to do just that while fighting alongside allies and a couple pets as well, but is this an enjoyable demon-slaying adventure or just a fight to be avoided? Castaway Village’s successes and unique twists aren’t enough to make it a title that’s going to stick around for a long time. There is fun to be had with Warriors Orochi 4, I certainly found myself hooked in once I got going, yet I don’t recommend this game for the uninitiated. It failed to leave a strong lasting impression, and I lacked the emotional connection to the story concepts. When it comes down to it, Sunless Sea: Zubmariner Edition is an ambitious game that failed to ultimately capture me. Early on it discouraged me from continuous play, and while I eventually got into a rhythm, the barriers of entry still gated off levels of enjoyment. Atelier Rorona Plus: The Alchemist of Arland is light-hearted, enjoyable, and one of the better role-playing games on the PlayStation Vita.